A masterpiece, very well done. Gee, usually Catholics are so liberal and pensive. Stealing Jesus makes them act all funny. It’s probably because they all simultaneously realised the implications of their ritual cannibalism, and it drove them to madness. There’s no other explanation. That… I can think of right now. Thing is, three days later, it comes back by itself. This is the kind of thing that I used to muse upon as a young boy in church. I learned early the “wut?” response. I was a smartass because we were Protestants; if we’d been Catholics, I might have been more strictly restrained. 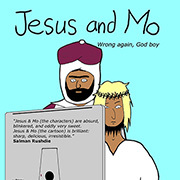 It is this universal appeal to our common puzzlement that is one of the things that makes “Jesus and Mo” a work of true genius. . In the halcyon days of my Lutheran youth, the pastor’s wife baked the bread for communion herself. The Catholics, of course, have a massive industry behind the holy Saltine (cf. http://indigestible.nightwares.com/2007/04/07/in-the-name-of-the-father-the-son-and-the-holy-toast/ and http://indigestible.nightwares.com/2007/04/20/nappy-headed-host/). I’m not sure which is more appropriate, but the home-baked Jesus cookies were always more tasty than the dry, flavorless God, Inc. version. FWIW, the Mormons just used Wonder bread. That, of course, tells you everything you need to know about their theology. Never start a debate about transubstantiation when you’re stoned. You’ll be there all night. Mass was based on the rites of the Mithras cult, god of choice for the Roman legions and one of the biggest reasons for the spread of Christianity, right up there with dropping the whole pacifism thing. Ummm. Home-baked Jesus cookies with raisons. I’m salivating. Would Southern Baptists eat those? Hmm, never looked at the resurrection myth that way. This is creepy. Following a few leads I got over at Pharygula, these people are so sure that their magic incantations have converted the wafer into Jesus’ body, that it can be worshipped. This they do by putting it in a ‘Monstrance’ and praying to it. All the while adoring it. Any crumbs and unused bits are flushed down the ‘Sacrarium’, a sink that goes to a hole in the ground under the church. Thus Jesus’ bits get buried on Holy ground and don’t end up in the sewer. Here we have people believing that bits of their god are buried all over the planet, in hundreds of thousands of different places. I wonder if the resulting mould and bacteria are considered Holy. And people really do worry about this stuff. At a Catholic Liturgy site, I found someone asking if the tiny bits of wafer that might be transferred from communicants’ hands to the missal booklets in the pews meant that special protocols should be instigated for booklet disposal. Catholicism reminds me in a strange sort of way of Hinduism – at the top you’ve got some quite erudite monotheistic theology, while at the bottom you’ve got all sorts of gibbering, credulous superstition, including a sort of polytheism (intercessionary saints indeed – as if an omnicient god would need little helpers). I did this once too. I never realised it was supposed to be bad. Poor Jesus, being kidnapped by that guy. I would have though it would have been better then being eaten, especially since Jesus tastes like cardboard. OK.. so it’s literally supposed to be his flesh.. what would worry me is – which bit of his flesh..? Is it a random thing or do you always get a bit of leg?? Is some poor old dear out there chomping on the Holy Member in front of her whole church? Do belly-button wafers taste of lint? Is a Jammy Dodger merely proof of biscuit based stigmata? But, JoJo, what came first, the cookie or the kook? Who other than a committed biscuit-dunker (with cannibalistic tendencies) would invent a holy ritual of dipping a baby’s head in liquid? Did everybody already write your note of support for PZ Myers to the President of the University of Minnesota? Donohue and his CLRCR is now inciting a witch-hunt against this biology professor, because he of the abovementioned blog-post called “It’s a goddamn cracker” about the whole wafer-fuss. Donohue: Ã¢â‚¬Å“It is hard to think of anything more vile than to intentionally desecrate the Body of Christ. We look to those who have oversight responsibility to act quickly and decisively.Ã¢â‚¬Â The university already deleted the link from their site to Myers blog. What’s next? ‘Desecration of the host’ used to be a charge leveled at Jews, just before the pogrom started. Starting in the 13th century. How thrilling to see that kind of thing making a comeback. $1million now, or the wafer gets it. At the Roman Catholic high school I was forced to attend, there was a chapel in the front of which was a separate room where the priest hid his supply of communion wafers. My best friend the Pegasus found it. Consequently, we both snuck in there regularly and kept ourselves stocked with some munchy manna. And another thing.. does this mean that when your devout Catholic goes for a post Communion Poop, he is actually shitting the Little Baby Jesus down the pan? If the crumbs have to be washed down in to consecrated land after Communion, should we not be having loo-blu’s loaded with Holy Water just in case? Is there a market for the Holy Stool on eBay? Radical Sapphoq could have missed out on a real money spinner, given the potential raw material in his High School stash.. Oh I give up.. this is just too easy to ridicule.. Spoils the fun.. If I’d have known that the wafer literally becomes the body of Christ, I’d have asked for it medium-rare on all those occassions I was parentally frog-marched along to our weekly cult jams. So if you’re bulimic and Catholic, does that mean you’re self-aborting Jesus after every holy meal? I don’t know which is better the cartoons or the comments. I found this site by accident and it reminded me of a friend who have a strange sense of humor like you guys. He reffered to Easter as “dead-guy-on-a-stick-day”. I know but I still laugh out loud every time I think of him. Of course I sent him the link to this site. Keep up the good work…. P.S. if you choke and die on the “cracker” do you go straight to heaven??? Have you ever seen the film El Crimen de Padre Amaro (Father Amaro’s Crime)? There was a character, an elderly nutty woman, who collected wafers, and later on, she fed her cats with them. Her cats were almost heard to reply ‘Amen’ when giving to communion to their crazed owner. 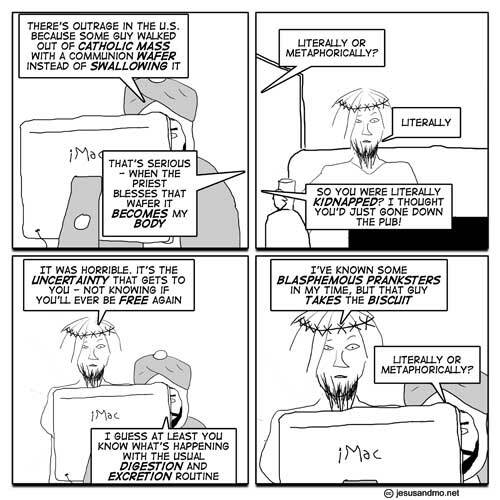 ‘long as I have my pasta Jesus……..
Well, someone had to update that old standard. @Daniel– the jesus cracker must be pretty low in fibre if you have to wait 3 friggin’ days for it to “resurrect”. Do these crackers actually contain Jesus’ DNA? That’d make an interesting follow-on for the Jurassic Park franchise.